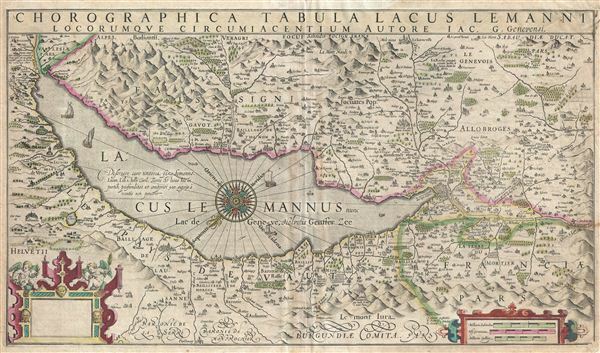 An uncommon and beautiful c. 1630 map of Lake Geneva drawn by Gerard Mercator and published by his successor Jodocus Hondius. Oriented to the southwest, this decorative map covers all of Lake Geneva from the Rhone River in the northeast to Geneva, inclusive of the full Canton of Geneva. The map includes numerous decorative elements including sailing ships in Lake Geneva and the stunningly rendered Alps. A large and appealing compass rose sits in the center of the Lake. A blank title cartouche appears in the lower right, suggesting the Hondius planned to add his own impression, but never completed the job. Mercator, G. and Hondius, J., Gerardi Mercatoris Atlas sive Cosmographicae Meditationes de Fabrica Mundi et Fabricati Figura, (Amsterdam, French Edition) 1630. Very good. Slight wear on original centerfold. Even overall toning. A few older margin repairs not extending into printed area. Original platemark visible. French text on verso slightly cropped at bottom margin. Van der Krogt, P., Koeman's Atlantes Neerlandici, 4985:1A.